MUX is a powerful tool. Definitely caters to tweakers. Interface annoyances. Outdated design. Over-reliance on menus. Lacks some standard features. 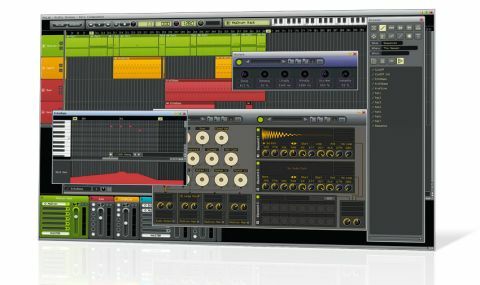 MuLab is designed and built by Jo Langie, the veteran developer behind Muzys and Computer Music's own CMusic - once the sequencing hub of our suite of free software. The MuLab series is the successor to the former. We're looking at the top-of-the-range UL edition, but there are also XT (€29) and Free versions. "The MUX modular audio engine blurs the line between plugin host and graphical audio programming environment "
The archaic-looking interface is a far cry from the polished front-ends of its rivals, but it does offer the same basic functionality: MIDI and audio recording and editing, VST instrument and effect hosting, mixing and so on. Where MuLab differs, though, is in its MUX modular audio engine, which blurs the line between plugin host and graphical audio programming environment (think NI's Reaktor, et al). For MuLab 5, MUX has been beefed up with some new features and improvements, including Sequencer Player and Note Key Ranger modules, an improved audio filter algorithm and an increased number of metaparameters. There are now also more options for fine-tuning the appearance of MUX front panels, so it's possible to create instruments and effects that look better and can be tweaked more easily. Other improvements include MuClips (preset files that combine a sequenced part with its target sound module), the Extended Shortcut System that lets you map QWERTY keys or MIDI notes to menu functions, and an integrated browser that, combined with the enhanced drag and drop, makes adding and moving effects and instruments more streamlined. Automation has been improved - curves between two points can have more shapes, such as sine and saw waves. One of v5's big new features is multicore processor support - pretty much all other DAWs have had this for years, though, highlighting the product's general outdatedness. Similarly, setup on a Mac seems old school, involving manually locating your VST plugins folder and making an aggregate device so that the computer's built-in input and output can be used at once; every other DAW we've tried does this all by itself. The default key assignments are lacking - for instance, you can't transpose MIDI via the usual method of selecting notes and using the up/ down cursor keys, and to access typical MIDI functions, you have to use the right-click menu's submenus (which have to be re-opened with a click each and every time). You can't type in values for things like fader levels either. "Our overriding impression of MuLab 5 is that it feels like a product of another, simpler era"
Setting up to record audio is fiddly, involving a settings page rather than the one-click 'arm track' approach of other DAWs. And there's no plugin delay compensation, which is forgiveable given the price, but without a simple track delay offset, you can't easily apply manual correction. Our overriding impression of MuLab 5 is that it feels like a product of another, simpler era. From the garish, chunky interface to the reliance on menus, it's an effort to get to grips with. Even when you do, the interface feels idiosyncratic and long-winded alongside other DAWs, lacking much of the functionality we've come to expect. On the plus side, MuLab seems stable, and there are neat touches like the adjustable pre/ post fader point. The software is not "broken" in a fundamental way, but a rethink of some facets of the interface and the implementation of standard DAW paradigms where appropriate (eg, record arming) is needed to bring it into line with modern expectations. The improvements for v5 indicate that things are moving in this direction, so hopefully this will continue. We can absolutely appreciate that MuLab has its fans, thanks to its unorthodox approach and modular architecture, but for music production, it's hard to recommend over more rounded and capable rivals. If you like the sound of MuLab, it's worth trying the free version, but most musos would be better off with a more professional DAW, like the cheaper and far slicker Reaper.